When updating a project to use LINQ to SQL, I found an issue with deploying to multiple environments. Each environment (development, staging, live) had its’ own database associated with this. Since I had the .dbml in another assembly, it was only reading from the app.config in the assembly it resided in. I was storing the database connection string in the web.config of the project so I thought it would be nice to just use that instead of the app.config. The first thing I needed to do was to keep the .dbml file from reading from the app.config. After opening up the .dbml file, I opened the properties window for the file. 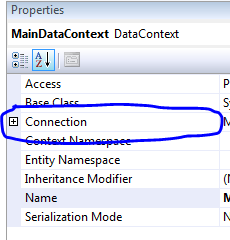 In the properties window, there is a setting for “Connection”. In the “Connection” dropdown I selected the “(None)” selection. That keeps the .dbml file from accessing the app.config for the database connection string. Now I needed to get my MainDataContext to use the Web.Config connection string. For this I created a partial class for my MainDataContext and created a constructor that passed the connection string from the Web.Config. Now when I deploy to different environments the .dbml file is accessing the correct database instead of the same one from the app.config.